"Ever since I was born, I was dope." That's a legendary quote from Andy Samberg in Popstar: Never Stop Never Stopping, a hilarious satire of today's music industry. 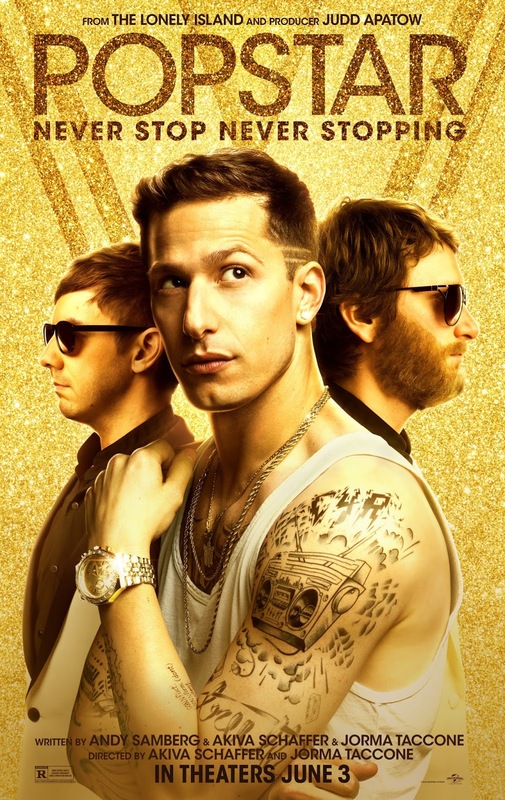 Samberg portrays Conner Friel, AKA Conner4Real & AKA Kid Conner, a rapper formerly of the boy band, The Style Boyz, along with Owen Bouchard, AKA Kid Contact (played by Jorma Taccone) & Lawrence Dunne, AKA Kid Brain (played by Akiva Schaffer). They were major influences on artists such as Usher, Nas, & Questlove, & their most famous song, Donkey Roll, was an extremely massive critical, commercial & cultural success. However, Conner overshadowed Owen & Lawrence, eventually leading to the band's breakup. Eventually, Conner went solo Conner4Real, with Owen as his DJ; however, Lawrence left the music industry & became a farmer. Conner's first solo album, Thriller, Also, was a major success, however, his second & newest album, CONNquest, has been a critical & commercial failure, with Rolling Stone giving it a 💩 out of 4 stars, with the only positive-seeming review coming from the satirical website The Onion. In order to raise ticket sales for his tour, rapper Hunter, The Hungry (played by Chris Redd) is put on as his opening act, which fails miserably as well, forcing Conner to re-think his career, & his relationships. Samberg, Taccone & Schaffer were hilarious, as well as the many cameos, namely Seal, Justin Timberlake, P!nk, Emma Stone & Joan Cusack. The screenplay from Samberg, Taccone & Schaffer is filled with many hilarious lines. Although the film does fall slightly short of comedic greatness, & does fall below their 2007 comedy classic Hot Rod, it is a hilarious satire of the music industry.